Follow the footsteps of Mankind into the wondrous, mysterious universe! 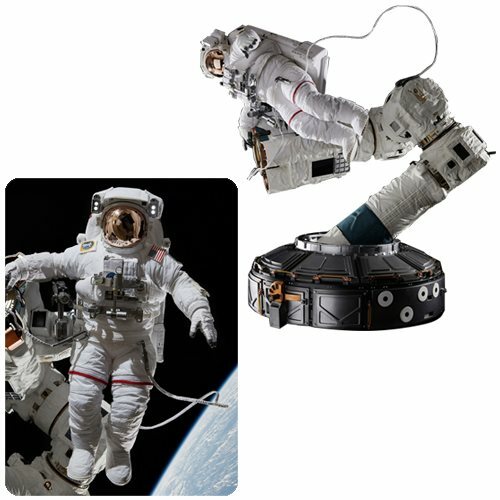 Ultra-realistic 1:4 scale NASA astronaut statue with light-up helmet. Features an exquisitely tailored EMU spacesuit and precisely detailed equipment. Comes with an SSRMS robotic arm and a Quest Joint Airlock diorama base! Includes 2 movable connecting wires, 20 interchangeable flags, and 9 mission patches. First in Blitzway's The Real series is this astounding The Real Astronaut International Space Station 1:4 Scale Statue. Featuring an exquisitely tailored EMU (Extravehicular Mobility Unit) spacesuit, plus precise and highly detailed equipment, this amazing piece includes a detailed SSRMS (Space Station Remote Manipulator System) robotic arm and a diorama base in the likeness of the Quest Joint Airlock for the International Space Station. There are also 2 freely movable connecting wires, 20 interchangeable national flags, and 9 mission patches. Plus, 4 LEDs light up the astronaut's helmet! Requires 2x "AAA" batteries, not included. Introducing Blitzway's "The Real" project series. Embark on the trip into space you've dreamed of as Blitzway presents the footsteps of Mankind into the wondrous, mysterious universe as an ultra-realistic statue. This project attempts to express real and sophisticated images of an actual NASA astronaut's appearance and robot arm as fully as possible, vividly reproducing the extravehicular activities in zero gravity. Blitzway is approved by NASA and the Canadian Space Agency for use in the artistic interpretation of spacesuits and robotic arms. The universe is near us - feel it in front of you now! Production details subject to change without any prior notice. Prototype shown. Final product may be slightly different.